The conference celebrates the launch of the CEDA-IADC guidebook Dredging for Sustainable Infrastructure and builds on its content. 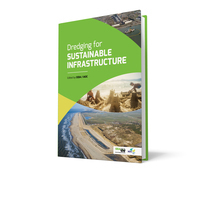 Containing contributions from leading specialists in the field, the publication Dredging for Sustainable Infrastructure will serve as an authoritative guide to delivering dredging projects that enhance the natural and socio-economic systems. For water infrastructure projects, the importance of vision and value creation, adapting projects to nature from the onset, and viewing a project and its effect over the long term are key to success. The insights presented in Dredging for Sustainable Infrastructure result from a wealth of up-to-date knowledge pooled by a team of scientists and practicing industry experts. The publication’s information has been moderated by an Editorial Board comprised of CEDA and IADC representatives. At the Dredging for Sustainable Infrastructure Conference, speakers will convey the publication’s mainstay topics. At this high-profile conference, new avenues towards the development of sustainable water infrastructure will be explored, and translated to your own project context. Experience first-hand what it means to apply this new approach in practice. Four key enablers to ensure success will be discussed, including the issues of valuation of ecosystem benefits, stakeholder engagement, adaptive management of dredging projects and the beneficial use of dredged materials.